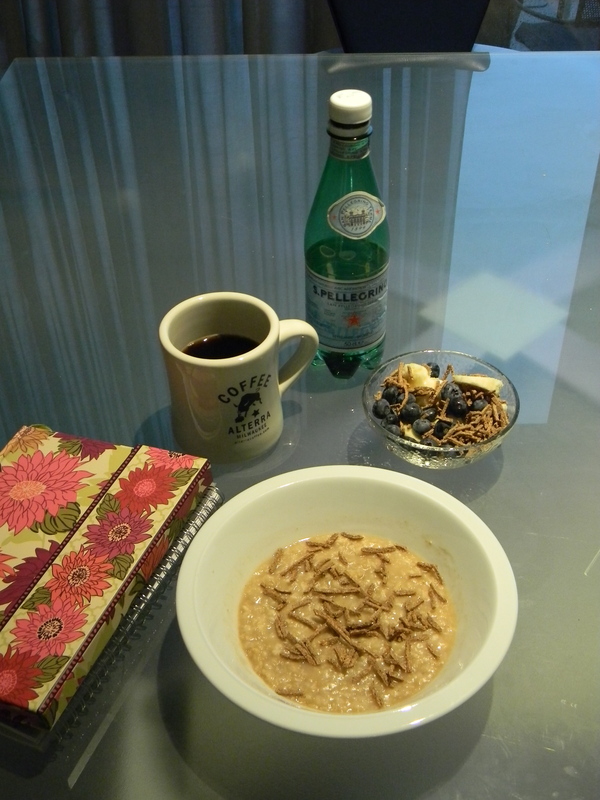 Breakfast is my favorite meal of the day (probably because it is the most acceptable meal to have coffee). I’m a creature of habit and tend to have the same thing every day. If you’ve visited us yet, you know exactly what I eat as I’m sure I made you bring it back from the States. I was supposed to workout today at the gym with one of my new friends, Lisa. It is SO much more fun to work out with a buddy – I find we workout longer because you do not get as bored. Unfortunately, it is pouring down rain here (unusual for Belgium – actually, this might be the first thunderstorm since we’ve been here). Anyway, our gym is about a 10 minute walk…so, no thanks. I melt in the rain. So, I’m going to do my latest Itunes workout dvd – “Jillian Michaels: Ripped in 30.” This is her follow-up DVD to the “30 Day Shred” which I absolutely LOVE. Level 3 – completed first and I was dripping in sweat by the time I was done (gross, but felt great). I don’t have dumbbells (haven’t found a store here yet that sells those) so I usually use new wine bottles or filled water bottles…weird, I know. The so-called ‘duck walk’ during circuit one is virtually impossible – I definitely don’t look like a duck…maybe a wounded one. Level 1 – I was pretty tired by the time I started this. I totally did the girly-pushups…I’d like to see a girl do regulars, seriously. Cardio is fairly easy on this level, but that’s why it is level 1. Overall, this DVD is a GREAT workout. In my opinion it is quite a bit harder than her ‘Shred’ DVD. I’d suggest doing that one first and then investing in this one. I like that this DVD has 4 levels…more variety. *Side bar – Our walls are VERY thin. I often wonder if my neighbor can hear me jumping around (he works from home). I find that very embarrassing, but I continue to do it. If he walks out into the hallway to go to the elevator, I totally freeze. I may just send you a little grocery list…nothing too crazy of course, mostly candy and/or snacks! 3 weeks-ish!